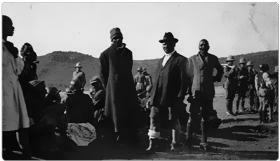 Letter from Enoch Mgijima to Theo T Truter, Commissioner, South African Police, Queenstown, written at Ntabelanga on May 22, 1921. This war is not for the kings or rulers of this world, but it is the war of the Lord God of Israel. Yours of the 21st instant duly to hand, I feel glad that to-day [sic] I am able to express myself to you, how God has sent me to his people. On the 19th April 1907, the Lord God had appeared to me by a vision. I was only a hunter of game and a sinner before God, but the God of Heaven and earth appeared to me and sent me to His people and whosoever shall hear his word, saying do you hear the sound from the west. The Lord informed that the war will begin in 1914, and from thence there shall be no peace on earth. The Lord God also informed me from what side it shall appear when it comes in Africa. You are just on its track, as you now stand. This war is not for the kings nor the rulers of this world, but it is the war of the Lord God of Israel. I the servant of the Lord do inform you therefore. That this war is not caused by me nor any earthly kind. I understand that you sir, intent to come out to Ntabelanga with an adequate force, may it therefore be known by you and all, that the armies and forces shall be ruled by God. As for myself, I am a messenger before the blood. The whole world is going to sink in the blood. I am not the causer of it but God is going to cause it. I am a man of blood, said the Lord. The Lord of hosts is his name. The time of Jehovah has now arrived, all nations are invited to the marriage of the Lord God of heaven and earth and also to the sacrifice of the God of Heaven and Earth Rev. 19:17-18 Ezek 39:17-20. God has now taken kindness away from human being. 1. In reference to your letter, as to arrest of certain men, this has already been replied to the Magistrate and to Native Superintendent of Locations, Kaematona. 2. As to anauthorised residents to leave Ntabelanga, this point has been often replied to even at the meeting in which you were present in December last, at last with the Commission of three men. 3. As to destroy houses erected. All houses were erected with the permission of the Authorities. This point has also often replied to. I understood that you sir, were coming out with an adequate force, and if resisted will drastically deal with. We are here praying to the God of our fathers, therefore we do not believe that Jehovah will allow it. I have been praying the Government about this matter for a very long time, until now, and am still praying the Government to allow the Israelite to pray to their God. You are informing us that you are coming out with an adequate force. Do you mean that you are coming to war against the God of Israel? If you then, sir, Mr Truter, are coming out to make war please inform me. I shall then write or say my last word before you destroy me.